Understanding equivalent fractions is an essential part of learning and understanding fractions. 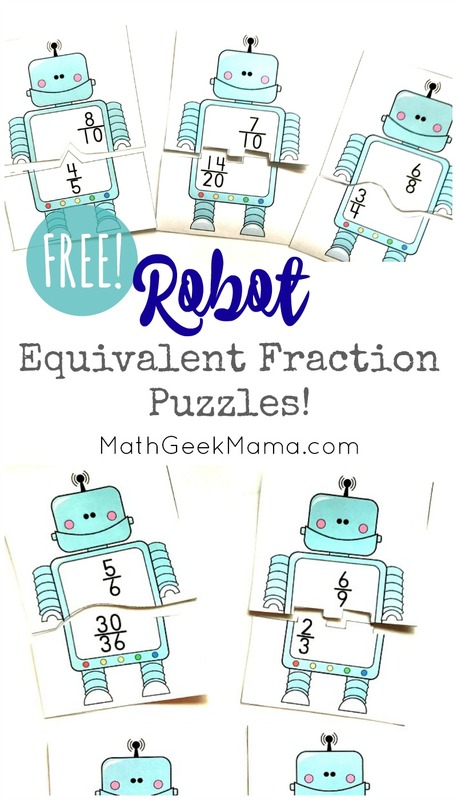 And today I have a fun way for kids to practice finding fractions that are equivalent: Equivalent fractions puzzles with adorable robots! 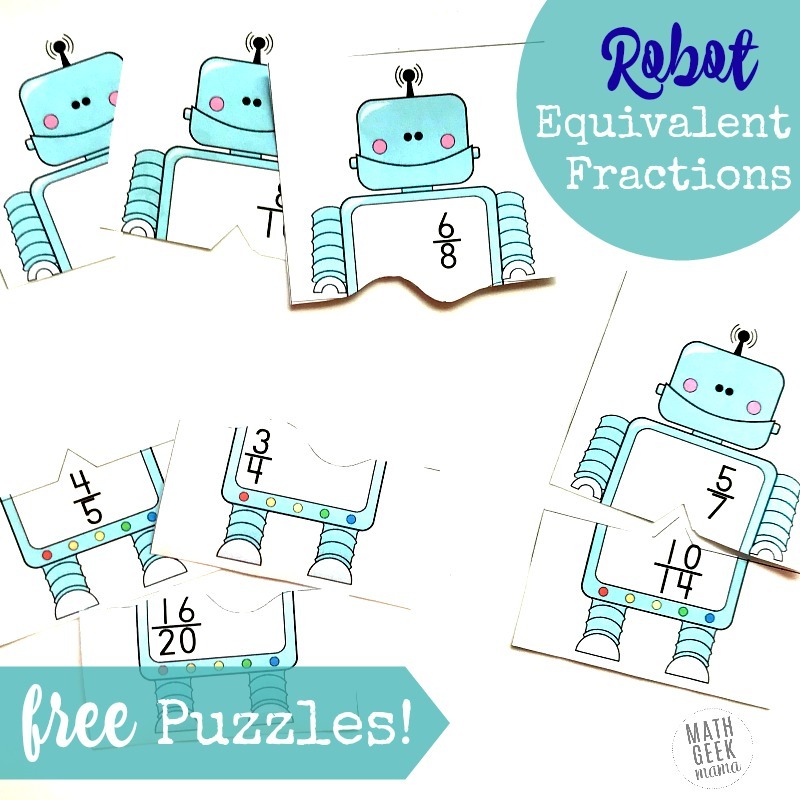 Obviously, before we pass out the equivalent fractions puzzles, we want to make sure our little ones know how to find equivalent fractions. But I want to challenge you to go beyond just teaching the formula. 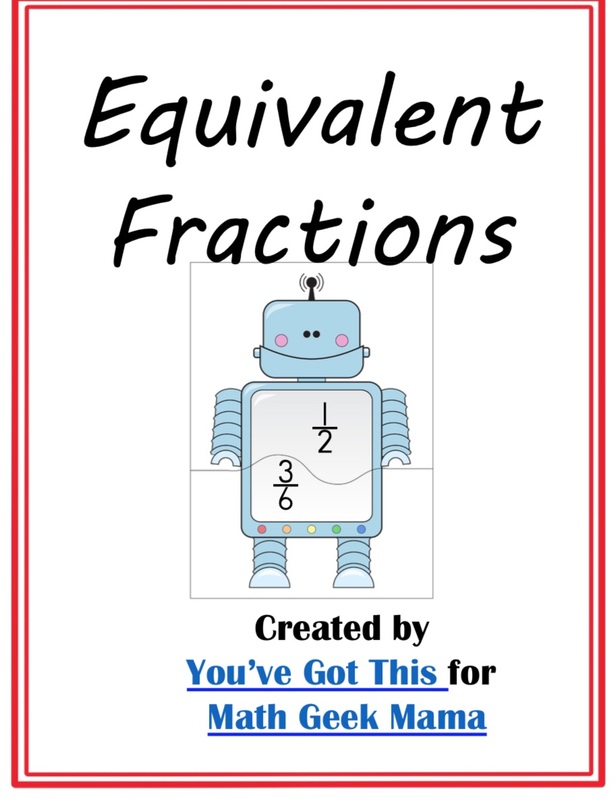 There are so many ways to find equivalent fractions, and each of the ideas below give kids an opportunity to explore this concept in a hands-on, visual way. This way of teaching is vital to our learners if we expect them to fully grasp and understand a concept. And once they have explored, now it is time to practice their new skills. With just a little bit of cutting, these adorable robots will be ready to use. And that is it! You are ready to go! There are so many different ways you can incorporate these equivalent fractions puzzles into your home or classroom routine. 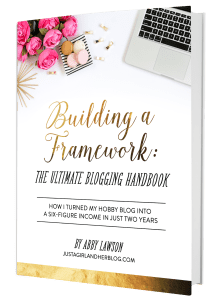 Here are a few fun ideas to get you started! If you are a teacher in a classroom, you know the need for weekly grades. But there isn’t a rule that the grades have to be a worksheet. All you need to do is hand out 20 puzzles, have the children solve them, record their answers, and then turn them in. 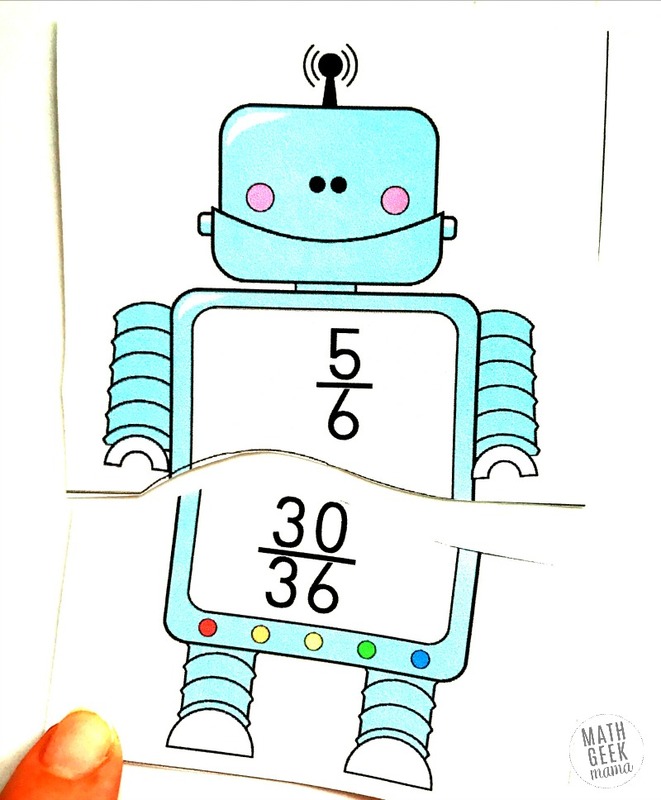 For this one, you will need to make several copies of the robot puzzles and have them cut out. Next place a pile of them at each group, partner, or individual. Then, have them race to see who can put them all back together correctly the fastest. Or if you are working one-on-one with a child, you can time them and see if they can beat their time. This is a great way to get children to practice equivalent fractions over and over in a fun way. This one is a great way to get children up and moving before a lesson, and a perfect way to get their brains thinking before math class. Begin, by giving each child a puzzle piece. Next, have them move around the room to find the person that has a puzzle piece that matches their piece. This is great practice and a fun teamwork exercise! I’m a firm believer in math centers even in upper grades. 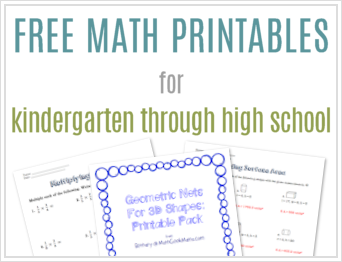 And with all the resources online, you could have a math center with an equivalent fractions game, another with task cards, and then the equivalent fractions puzzles. Now you can work with 1/4 of your class in a much smaller group. 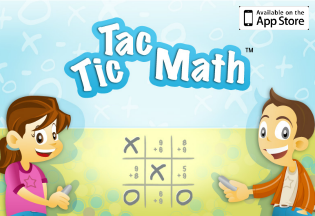 It is a great way to really help children practice math in a fun way while learning in a smaller environment. Practicing finding equivalent fractions does not have to be boring! And I hope your kiddos enjoy these puzzles.